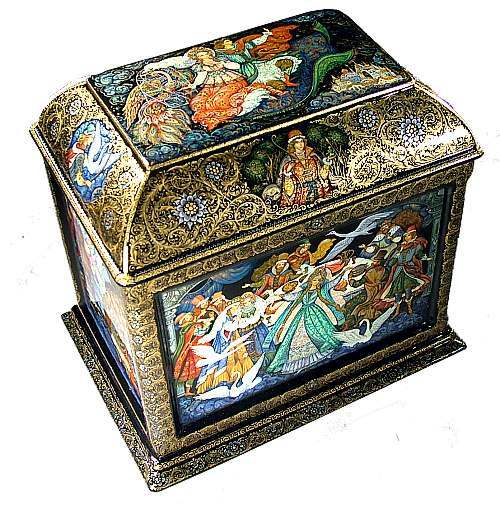 Scenes from five different fairy tales are played out on this magnificent casket drawn by Palekh artist Vera Smirnova. On the lid, the tale of "Flying Carpet" with an elaborate firebird is drawn in all her splendor. 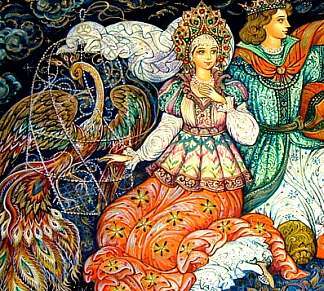 The drawings on the side show glimpses of The Frog Princess, Tale of Tsar Saltan, The Scarlet Flower and Tale of the Dead Princess. Just below the drawing of the lid, and sloping down toward the sides is a mid-level area filled with an extremely elaborate ornament and small vignettes corresponding to the fairy tale directly below. It would be hard to list in words all the details in this work, and we won't even try. Suffice it to say, each of the main drawings could be the basis for a very elegant and expensive lacquer box by itself. But if you put all the drawings together into one single work, like Smirnova did here, the result is something truly stunning that you usually only see within a museum vitrine. The box is made out of high quality papier mache. The lid lifts off and does not have a hinge. The box stands on four small carved feet. The box is signed with the name of the name of the artist, village, title year.